Preheat oven to 450F. YieldS 12 muffins. Line muffins tins with paper cups. 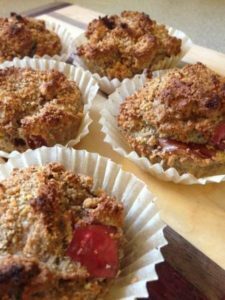 I like the parchment ones; the muffins release more easily. Measure out 1 cup fresh or frozen (make sure they aren’t all clumped together) raspberries and set aside. If you have a portion scoop or an ice cream scoop, now’s the time to pull it out. ADD raspberries and 3 TBSP. vinegar or lime or lemon juice. Working QUICKLY, use a spoon or rubber spatula to combine. 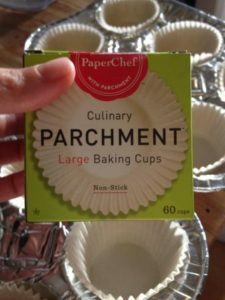 Working QUICKLY, use portion scoop or spoon to transfer mixture into muffin cups. Place rack in top third of oven and lower temperature to 400F for 20 minutes, then turn off oven but continue to bake another 5-10 minutes, or until fully cooked and muffin tops spring back to the touch. Remove muffins to cool on a cooling rack. Refrigerate for up to 10 days.